Legendary metal from the Castle Bathoven, Lapinjärvi region. 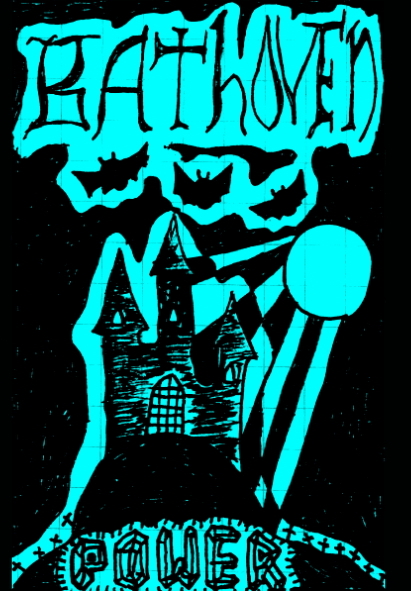 Bathoven was a short-lived metal group which only rehearsed and recorded in January 2012, but since then Bathoven has reached a cult status among the most devoted full moon worshippers. This cassette is their only output, including four tracks of blistering old school metal. Chains, leather, bats and metal! These mysterious chaps are associated with Lord Fist, Horros, Left Cold and Chalice For Your Loss, for and example. Limited edition of 50 hand numbered copies. Lyric sheet included. Green cassettes. DIY, so it looks very käppä. When you place an order, please tell me if you want the tape with light blue or green covers. There are also red covers available, but they are strictly limited to band members. The price is only two euros (plus shipping)! As usual, place your orders to piparnakkeli.kamakarhu AT gmail.com. Releases JPAR-006, JPAR-007 and the fourth issue of Ajatuksen Valo out within a month or so.